Watch AIRAT2 on action !! 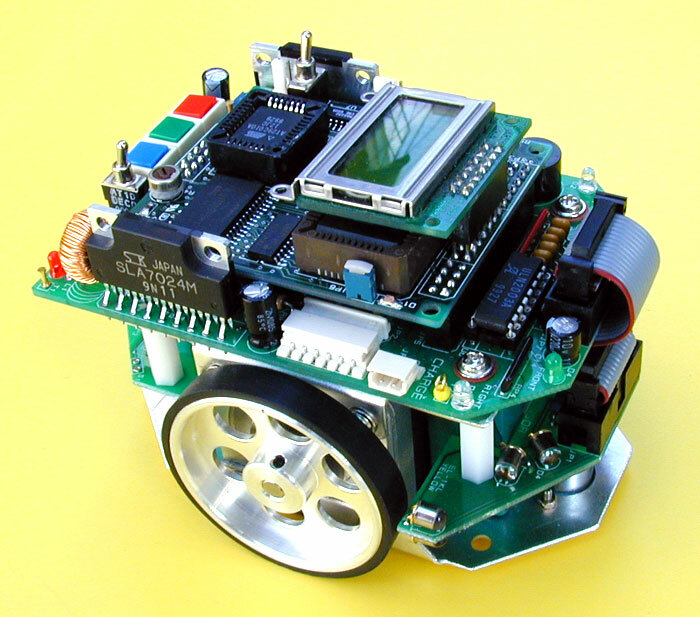 AIRAT2 is a micromouse robot that uses an 8051 CPU. The AIRAT2 emits a beam of light and uses sensors to receive the amount reflected back. 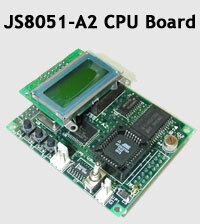 The CPU board utilizes the JS8051-A2 board. The JS8051-A2 is very well constructed. It uses powerful outside resources such s LCD, ADC, two external timers, self-FLASH writing and more. The AIRAT2 uses six sensors, enabling it to move diagonally. A PC simulator is provided, enabling the user to more easily understand the high-level mouse search algorithm. The C source code is provided so that the programmer can easily develop algorithms that can be tested on the simulator and then moved to the mouse. In addition, LCD, serial communication, mouse control and other functions are provided as library and source files. Besides the basic utility program, the programs generating accelerating/decelerating table code and various turn table code are provided with their sources. For those who want to learn high-level mouse skill, AIRAT2 provides an excellent environment for development, test algorithms, and much more. - Able to self adjust. Learns as it goes. - Uses 6 sensors allowing it to move diagonally. - Easily assembled / disassembled. - Assembly instructions and user's manual. - Includes a PC simulator to accelerate development. - Libraries, C source codes, and utilities provided. - C compiler ( IAR 8051 C compiler ) DOES NOT come with the package. The JS8051-A2 Board is a small 8051 CPU board developed for High-end users. An A/D converter and two 16 bit external timers were provided to compensate for any problems with a standard 8051 CPU. It uses a four layered board and SMD (Surface Mounting Device). It has three push switches including a reset switch, a power input port, a toggle switch for power on/off, a serial communication port and a LCD connector port. It has the same convenient RAM down loading and Auto run abilities as the JS8051-A1, and in addition has self flash memory writing. Therefore, even without a memory backup or a ROM writer, the whole program can be written and kept easily. Furthermore, if you use the self-flash memory writing function you can write a 64K-byte program. This is the maximum size of the 8051 program memory. There are no special limiting conditions relating to the program. If you use the convenient functions built in to the JS8025-A2 you can create an embedded system, micromouse and other similar robots easily. For reference, AIRAT2 is a micromouse using JS8051-A2 board. 34 pin x 1, 16 pin x 1 Data bus, Address bus, Control bus, Power, User CS, Counter Out, A/D input, Serial Etc. - MCS-51 family and compatible CPU usable. - 22.1184 MHz clock operating. - External 8-bit 8-channel A/D converter. - Two 16 bit timers. They are decremented by a 4 MHz OSC clock. MSB's of counter can be used by interrupt source (/INT0, /INT1) and user application (header pin out). - Able to do 'RAM down loading & Auto run'. Able to carry out the user's program in RAM that is working as ROM. - The down loading is carried out at a speed of 115,200 bps through the serial port. - Self flash memory writing. During down loading it is possible to write the user's program to flash memory directly. In this case the user's code could be up to 64K bytes. 64K bytes is the maximum size of the 8051's program memory. If you use this ISP (In System Programming) function the field upgrade is easily done. - Provides two writing only chip selection signals and one read/write chip selection signal for the user. - Able to connect LCD into the LCD port without a cable. - Power signal LED, user's LED. - 5V-power input port, toggle power switch, two push button switches for user, serial communication port, 34 pin, and 16-pin bus extension port. - User manual, a program CD, a download cable and a power cable included. Here is the H546 stepper motor datasheet.